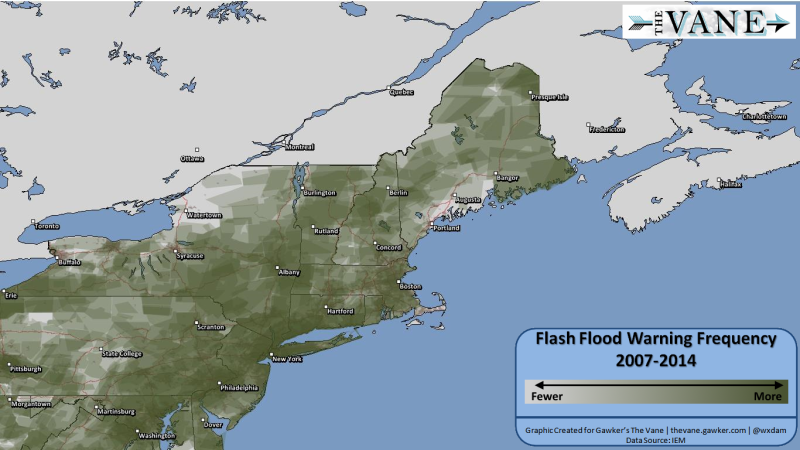 Maps: Which Parts of the U.S. See Flash Floods Most Often? With the recent spate of flash floods in Detroit and Baltimore and New York, a common question rising in the storms' aftermath asks how often certain areas of the country see flash floods. I put together some maps to show how frequently different parts of the United States experience these dangerous torrents of water. A flash flood is the rapid onset of flooding due to extremely heavy rainfall in a relatively short period of time. In low-lying areas, especially near creeks, streams, and in hilly urban areas, water can rise very quickly during a heavy rainstorm. The floods sometimes occur with very little (or no) warning. One of the ways we can tell how frequently flash flooding occurs is to look at the number of flash flood warnings issued by the National Weather Service. Unlike tornadoes, which can develop so quickly that meteorologists and their technology can miss them and fail to issue a warning in time, it's hard to not issue a flash flood warning when the threat exists. Meteorologists use a product called "flash flood guidance" to aid them in determining when heavy rainfall presents a threat to those under the storms. The guidance shows how much rain has to fall in a certain period of time (say, two inches of rain in an hour) in order to create conditions favorable for the development of a flash flood. The factors that allow for the development of flash floods include soil moisture (soil too moist or too dry can't efficiently absorb heavy rainfall), terrain, proximity to bodies of water, and urbanization. Urbanization is an important factor in flash flooding. Unlike a thunderstorm over farmland where water can seep into the ground, when heavy rain falls over a city, it's hitting pavement and running off into the sewers. As Dr. Marshall Shepherd noted on Twitter last week, the sewer systems in cities were designed back in the 1950s and 1960s, and they aren't able to handle heavy rainfall events today. It usually takes a less intense storm to produce flash flooding in downtown areas than it would in a place like Carroll, Iowa. Let's take a look at seven years' worth of flash flood warnings (almost 27,000 in total) issued by the National Weather Service between early 2007 and July 2014. I chose 2007 for two reasons: 1) the NWS began issuing "storm-based warnings" in October of that year, which limits a warning polygon to the area affected by the storm rather than for the entire county; and 2) the Iowa Environmental Mesonet's flash flood warning data for 2006 is missing, and I would rather not have an entire year missing from the data if I wanted to go back further to 10 years. Taking a look at the entire country, it's clear that most of the flash flood warnings issued by the NWS occur east of the Rockies, with two areas of higher density around the Mississippi River and the I-95 corridor from D.C. to Boston. The southwestern United States also stands out as a hotbed of flash flooding. We'll start in the northeast and work our way clockwise through the rest of the country. The frequency of flash flood warnings over the seven-year period lowers as you move north and west away from the megalopolis. 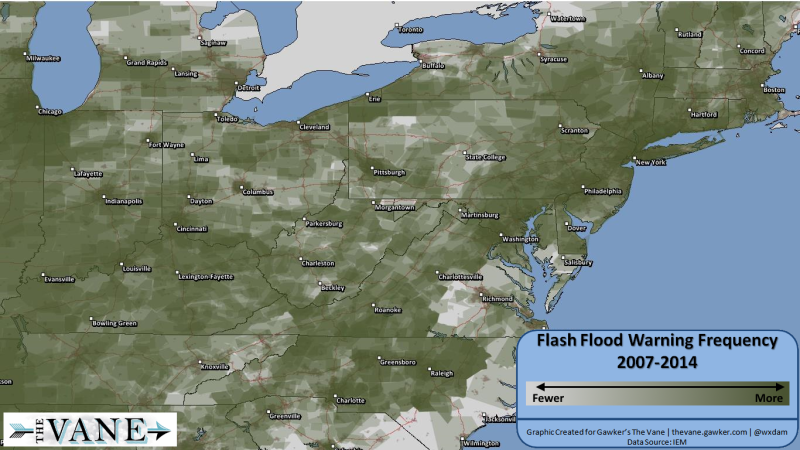 The highest density of flash flooding occurs in the immediate vicinity of downtown areas such as New York City, Philadelphia, and Washington/Baltimore. The densely-packed streets, parking lots, and sidewalks don't allow the water to absorb into the ground, forcing it to run off and increase the risk of urban flash flooding. In the Mid-Atlantic region, the warning frequency starts to grow a little blocky. As a resident of central North Carolina, I can attest to the fact that the state often sees flash flood warnings. Thunderstorms tend to move through this area very slowly, creating runoff issues, especially in cities such as Greensboro and Raleigh. If you're wondering why the warnings are so blocky, it's a result of bureaucracy. There are more than 100 National Weather Service offices in the United States, and each one has a "county warning area," or an area of responsibility for which they issue forecasts and warnings. They can't issue warnings outside of their CWA boundaries, so the end result is a blocky mess of warnings when you zoom-out to a regional view. It shows there's no real environmental reason for the blocky nature of the warnings, but rather it's the result of jurisdiction and one group of forecasters seeing a higher threat than forecasters at a neighboring office. 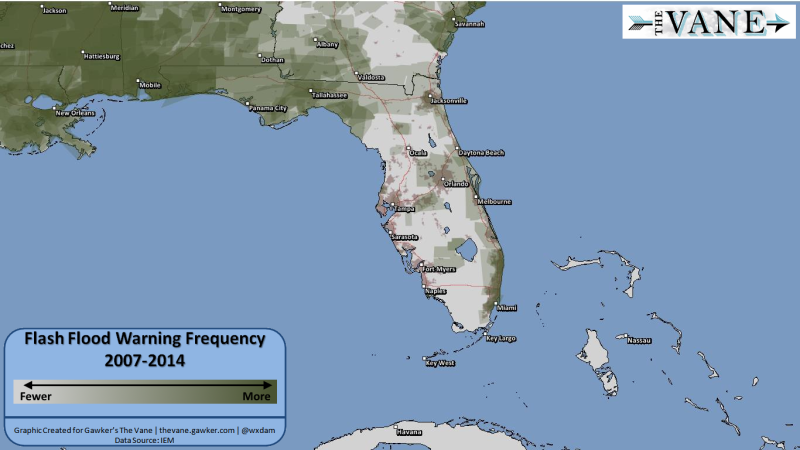 The southeastern United States is able to hold its water a little better given the relatively sparse population density compared to the northeast, but that changes once you get into the swampy areas of the northern Gulf Coast. 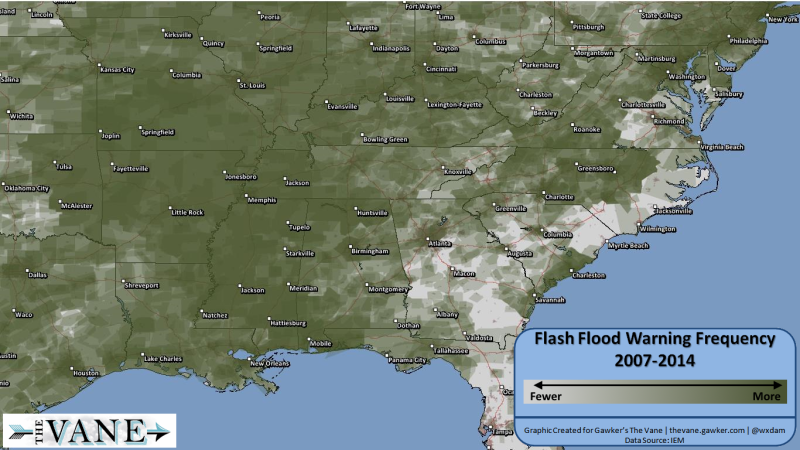 Southern Alabama and Mississippi see some of the heaviest rainfall in the country (Mobile is the wettest city in the U.S.), so the water frequently overwhelms the infrastructure and leads to flooding. 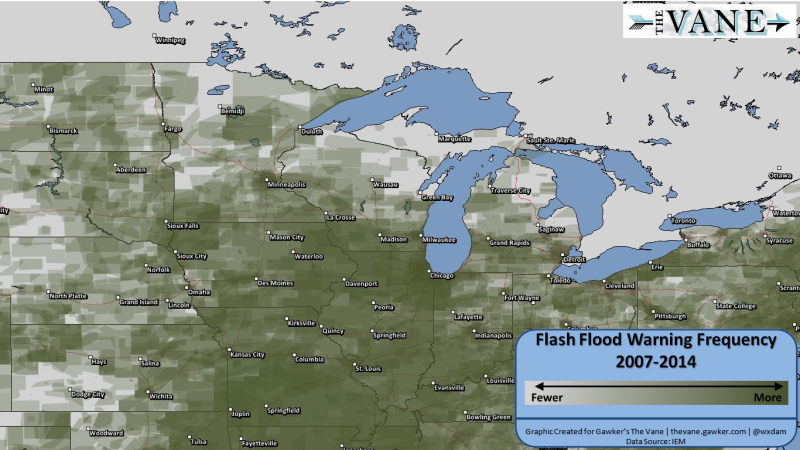 The propensity for heavy rainfall along with the low-lying, saturated nature of the terrain in the Mississippi River Valley also leads to frequent flash flooding, accounting for the near-solid green color on the map. 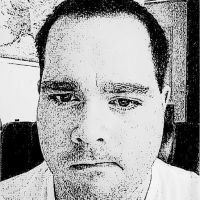 If you pick up one message from this article, it's that we humans are the cause of a lot of the flash flooding we see on the news. Just look at Florida as an example. Florida as a whole doesn't really see much flash flooding, but take a close look at the strip of cities along the state's southeastern coast. Most of the flash flood warnings in Florida are confined to cities where water has a hard time running off into the environment. Taking a look at the south-central U.S. doesn't yield many surprises. The blocky nature of the warnings in Texas is a result of NWS offices issuing warnings based on counties rather than the storms, in addition to the office boundaries (look around Lubbock for a great example). Moving north so we don't forget our friends in the Midwest, much of the flash flooding that occurs in the region is the result of thunderstorm training (heavy storms constantly moving over the same area like train cars on railroad tracks). The soil is very fertile in the area and can hold its fair share of moisture, but when it gets too saturated, the water just runs off and creates a dangerous situation for residents. Again, for the urban effect, look at the dense warnings around downtown Chicago and Minneapolis. 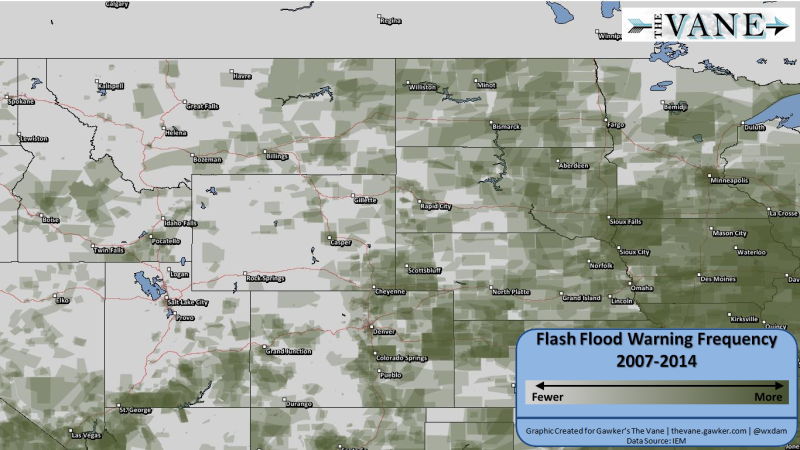 As we move into the western Plains and the Rockies, flash flooding becomes more sparse due to the general lack of convection most of the year. The worst flooding in the area often occurs along the eastern side of the Rockies in eastern Colorado, especially around Colorado Springs. The southwestern United States sees quite a few flash flooding events thanks to the monsoon season. The desert areas have an interesting feature called "arroyos," which are also called "washes" or "dry creeks" depending on who's talking. These are dry creeks which stay dry until there's a heavy rainfall event upstream. Oftentimes, arroyos fill up all at once, with a wall of water rushing downstream from the thunderstorm. Every year people are killed because they're hiking in an arroyo and there's a thunderstorm miles away, sometimes so far away that it's sunny where the doomed hikers are located. Above is a video of flash flooding in an arroyo in Nevada, showing how it goes from bone dry to a few feet of swiftly-moving water in less than two minutes. 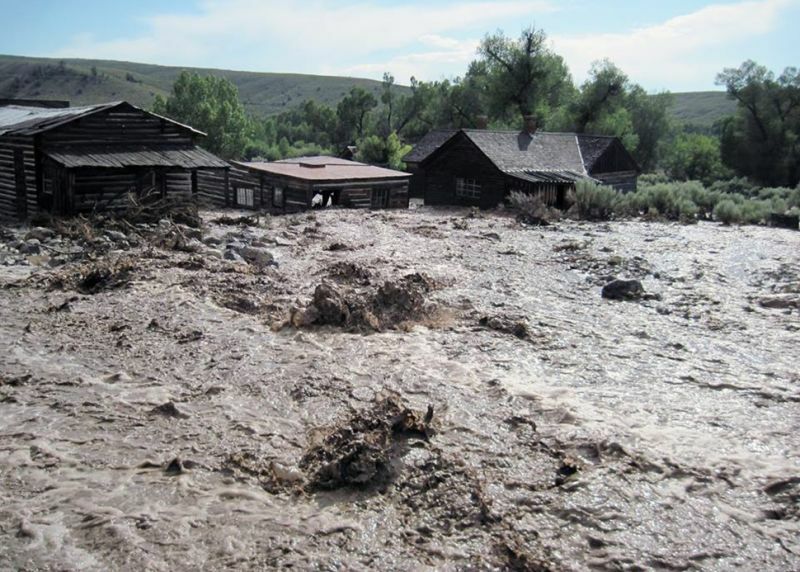 The northwestern United States doesn't see many flash flood warnings due to a general lack of thunderstorm activity, but heavy rainfall in valleys can prove dangerous, especially with the risk of mudslides. Why Doesn't the West Coast See Thunderstorms? 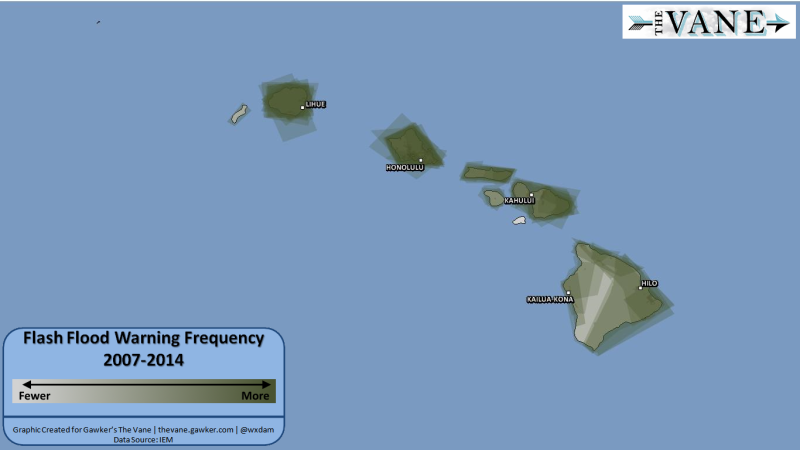 Hawaii often sees flash flood warnings during heavy thunderstorms, except for the leeward side of Mauna Kea and Mauna Loa. Much like Hawaii, Puerto Rico's tropical location allows the territory to see frequent heavy rainfall events, some of which produce flash flooding. 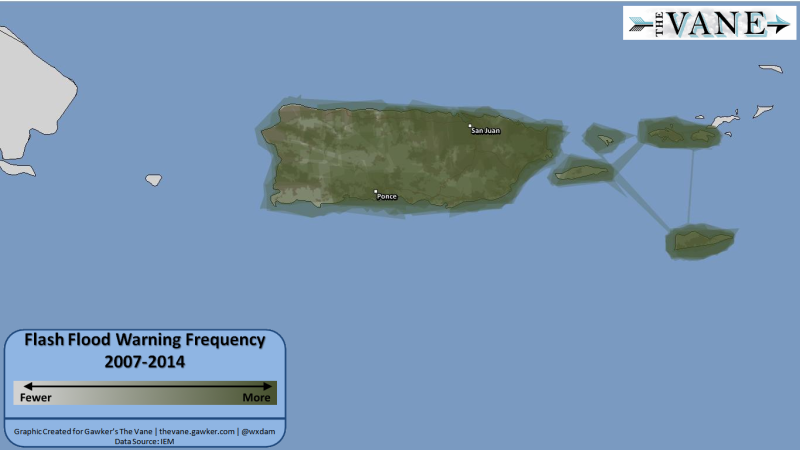 The NWS office in Puerto Rico is also responsible for issuing warnings for Vieques and Culebra (the two islands just off PR's eastern coast) as well as the U.S. Virgin Islands, which are the easternmost two islands covered in green. A slight but noticeable pattern emerges on Puerto Rico, as the windward side of the island sees flash flooding more frequently than the leeward side. 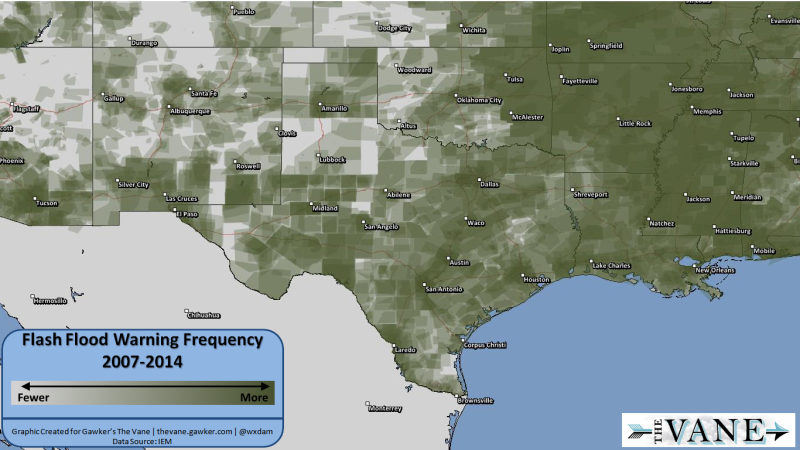 Overall, flash flooding in the United States most frequently occurs pretty much where you'd expect — highly urbanized cities and areas that have high soil moisture (parts of the Midwest) and extremely low soil moisture (the desert southwest). 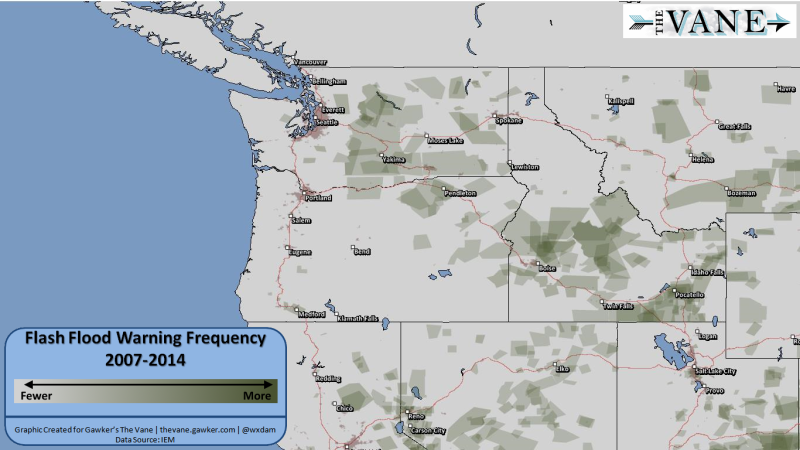 Regardless of where you live, if the NWS ever issues a flash flood warning, don't ignore it. Driving through a flooded roadway is one of the stupidest ways to die. The need to go somewhere isn't that important, especially since people who drive through floodwaters not only risk their lives if they get stuck, but the lives of those who have to wade out there to rescue them.